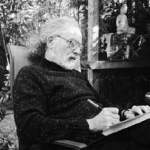 BARRY SPACKS has taught writing and literature for many years at M.I.T. and UCSB. He’s published individual poems widely, plus stories, two novels, eleven poetry collections, and three CDs of selected work. His first novel The Sophomore has just been brought back into print in the Faber & Faber Finds series. His most recent poetry collection (Cherry Grove, 2012) presents a selection from ten years of e-mail exchanges with his friend Lawrence E, Leone. It's called A Bounty of 84s (the 84 being a stanza limited exactly to 84 characters, echoing the traditional notion that the Buddha left us 84,000 different teachings because humans have so many different needs, are all of us so differently the same).